I've made this many times and it's a big hit with family and friends. Cut each biscuit into quarters - put aside. 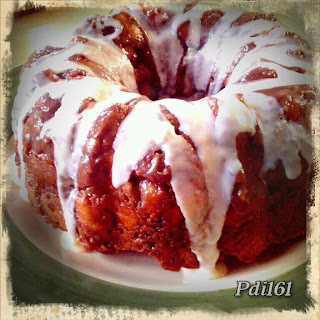 Grease Bundt pan. placed some chopped nuts in the pan. Now, half of those quarters, and layer them in the bottom of your greased bundt pan. You should also preheat your oven to 350F. In a small sauce pan, heat your cream. Add the brown sugar to your cream. Then add 1 1/2 tablespoons of cinnamon. When you get a nice deep brown color, stir in 1 cup of chopped walnuts or pecans, your choice. Pour the mixture into a 2 cup measuring jug. You should have about 2-2 1/2 cups of this mixture now. 1 cup will go on the lower layer, and 1 cup will go on the top layer of biscuit quarters. Pour the mixture around the bundt pan, over the biscuit quarters. Remember, use only half of your mixture, about 1 cup. Now place your pan in your preheated 350º oven, and bake for 45-55 minutes, or until golden brown. It is important not to overcook this cake. So after 45 minutes be sure to check it and if you think it's not done just check it every 5 minutes after that. Once out of the oven, give the cake 10 minutes to cool slightly, and then flip on to a plate or platter. I used the frosting that came in the cinnamon roll cans over the top. I've seen many Monkey Bread videos on YouTube but noticed that none were like mine so I decided to make this video and share my version. Love that monkey in the photo. Never made monkey bread, I really should give it a try.